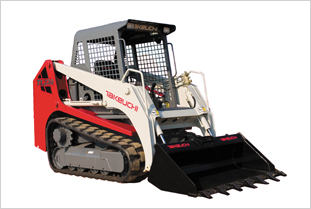 The sturdy all welded frame and heavy duty oversized undercarriage of the Takeuchi TL230 Series 2 compact track loader provides hours of reliable service. An unrivaled blend of floatation, traction and breakout force allows the TL230 Series 2 to power through the most difficult material with ease. The operator’s station offers low effort pilot controls and proportional auxiliary switches to give the operator the precision needed to work more efficiently in a comfortable fatigue free environment. Agility and maneuverability make the TL230 Series 2 an excellent choice for any size job that requires unsurpassed performance.